We use the faucets and showerheads in our home every day. Sooner or later, even the best faucets need repair and replacement, due to normal usage. A leaky faucet might seem like a minor nuisance, but the effect it has on your water bill is nothing minor at all. Sometimes, a small leak can be a blessing in disguise, if you’re looking for a reason to remodel with upgraded fixtures that are more efficient, stylish and functional. Master Plumbing & Mechanical provides repair and replacement service for faucets and showerheads in your home’s kitchen or bathroom, as well as outdoor spigots. Few problems can disrupt the daily operation of a household more than a dysfunctional shower. Whether a shower doesn’t flow properly, or leaks through the floor, an immediate repair of a problematic shower should be a top priority. 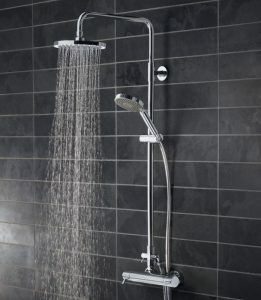 Common shower-related issues include but are not limited to leaking shower trays, clogged drains, broken showerheads and insufficient hot water. Whatever the problem, a quick resolution can make everyday life much more comfortable. Unfortunately, not all water faucet problems occur inside the walls of a house. Occasionally, outdoor spigots can malfunction too and are just as important to repair as the faucets inside the house. A leaky outdoor faucet may not seem to cause as much damage as a leaky indoor faucet, but excessive water flow can lead to flood damage and significant increases on the water bill. If an outdoor spigot ceases to produce water, homeowners will quickly notice the impairment of not being able to water plants, play in the sprinkler, wash a car or bicycle, and much more. Shut-off valve: The solution to a non-functioning spigot could be as simple as turning the valve back on inside the house. Low-water pressure: A blockage in the outside pipe could be keeping water from properly flowing. Decayed washer: If an old washer becomes brittle and breaks apart into the pipe, it could block the flow of water. Seal problems: Tightening the collar nut around a faulty seal could be a simple way to stop leaking. Water leak: An especially high water bill could be an indicator that water might be leaking through a broken pipe between the wall of the house. Clog: Sometimes, hard water with high mineral content can crystallize and block the flow. Master Plumbing & Mechanical services the Washington, D.C. metropolitan area. Contact us for an estimate on faucet or showerhead replacement or repair.